NTIL has a scoreboard for hire. 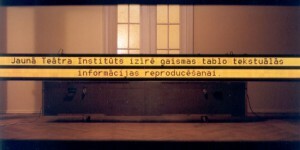 It can be used for subtitling performances or films with a previously prepared and edited text. The text can be static or moving (from left to right, from top to bottom, from bottom up). The text has to be written on a floppy disk in WORD 95 or NOTEPAD format. Short texts can be edited and programmed shortly before they’re displayed using the NTIL scoreboard computer. The scoreboard has two textual rows, each consisting of 64 symbols. Length of a row – 4.8 m, height of a row – 0.12 m. Size of 1 symbol – 120 x 75 mm. Size of the scoreboard – 5.0 x 0.4 x 0.14 m, weight – 64 kg. Size of the box – 3.0 x 0.6 x 0.5 m. Power supply – 220V. Text has 16 levels of light intensity. Price for scoreboard hire – 150 EUR/per day. Additionally, you should consider the costs of text editing, setting up and transportation of the scoreboard. 30 pieces of stage platform available. Size of a single piece – 1.5 x 3.0 m. Height is alterable. Price for stage platform hire – 4.50 EUR/per m2/per day. 150 folding chairs available. Price for chair hire – 0.70 EUR/per chair/per day. 7 sets of coloured string lights available. Length of a single set is 15 m, consisting of 20 lamp-sockets. String lights are durable in outdoor conditions. 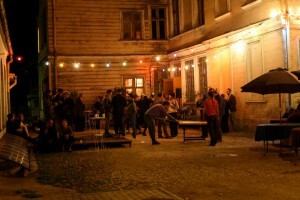 Price for string light hire – 11 EUR/per set/per day.